We’re excited to announce our final special event for 2018 to cap off this fantastic year. Get ready for a double-feature on Saturday Dec. 8t at Phidon! 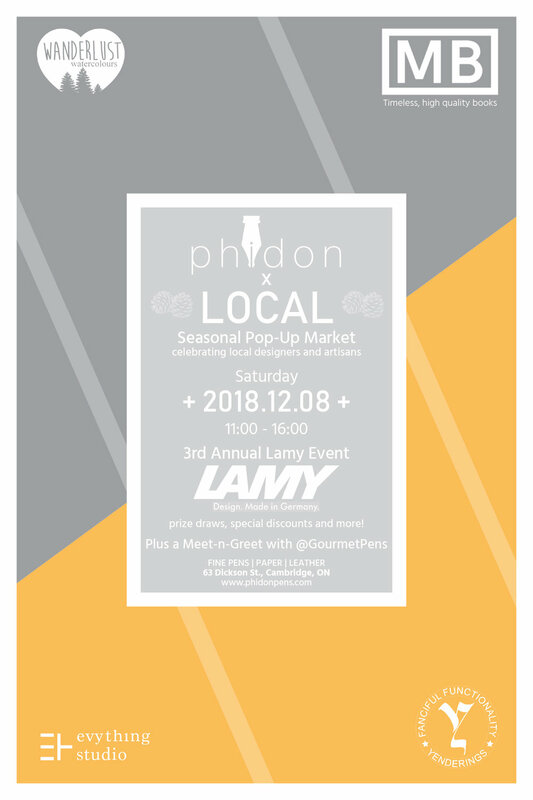 From 11:00 - 16:00, we will be hosting the 3rd Phidon x Local Pop-Up Market featuring local artisans and craftsmen who make beautiful stationery products and desk accessories. Evything Studio, MacLellan Books, Wanderlust Watercolours, and Yenderings will be visiting the store with their unique, handcrafted products and answering any questions you have about their work. If you’re looking for locally made writing gifts for your family and friends, be sure to check out the last Phidon x Local of the year! On that very same day, we will be holding our 3rd Annual Lamy Event, where we will be showcasing the full range of products from the popular German pen-maker. A Lamy ambassador will be on hand to help you to learn about the unique design aesthetics of the brand and find the perfect Lamy pen for you. We will also be running a special discount on all Lamy products at the store, from the perennial favourite Safari to the iconic 2000. There will also be a Q&A session (from 12pm - 1pm) on fountain pens basics and maintenance, with demonstrations of how to clean several different fountain pen models. If all of this isn’t enough excitement yet, we will also be joined by blogger Azizah Asgarali (GourmetPens)! She will be visiting our store for a meet-and-greet with fellow penthusiasts, and sharing with us her love for pens and inks. Refreshments and treats will be provided. We look forward to seeing everyone again!